The history of Vancouver Island, British Columbia is an interesting amalgamation of First Nations and European culture and heritage. It began with Captain Cook’s arrival at Nootka Island in 1778 and, subsequently, as English and Spanish explorers found their way to the lush paradise of the Pacific Northwest. Today, the combination of Aboriginal, Spanish and English heritage is reflected in the place names along the BC coast. Toquaht Nation Artwork in Toquart Bay, Barkley Sound, West Coast Vancouver Island, British Columbia. Saturna, Galiano and Estevan have exotic Spanish derivation, while Cook, Douglas, Chatham and Cavendish hearken back to English discovery and governance. Indian names like Cowichan, Songhees, Haida and Sooke (T’Sou-ke Nation) come from an Aboriginal population that has inhabited the Island since the ice age. If you stare out at the smoky Sooke Hills on a misty day, or visit Goldstream Park during the salmon run in November, it is easy to imagine the life of the First Nations people on the Island prior to European arrival. In the Rainforest, where old growth areas have been preserved, one gets a glimpse of the past, unadulterated by the changes wrought in this century. There are three main First Nations groups on Vancouver Island: the Kwakwaka’wakw, the Nootka and the Coastal Salish. Their way of life was based on the generous bounty of the earth, and their spiritual culture on the natural world. Visual manifestation of this rich culture is evidenced in elaborately carved totem poles and beautifully constructed longhouses that grace the Island. 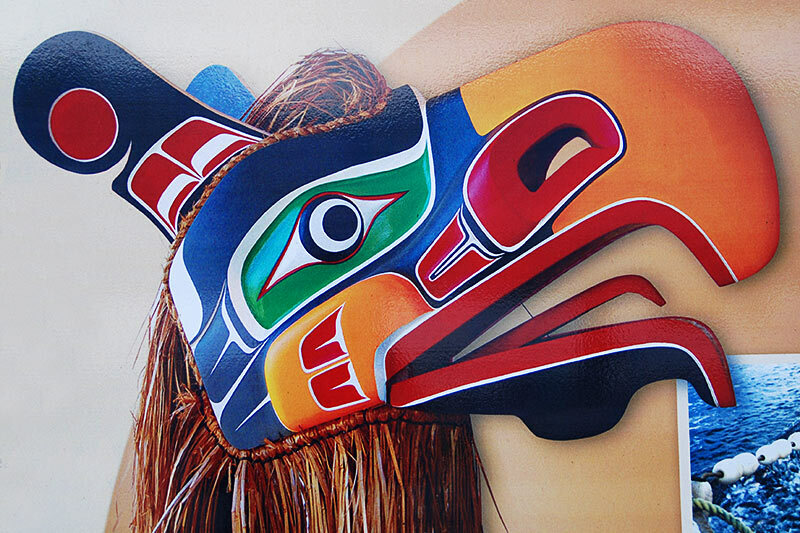 First Nations’ artwork, masks and clothing are appreciated internationally for their singular beauty. The U’mista Cultural Society was incorporated under the British Columbia Societies Act on March 22, 1974. Since that time, it has worked towards fulfilling the mandate to ensure the survival of all aspects of cultural heritage of the Kwakwaka’wakw. The colony of Vancouver Island began with the arrival of John Meares in 1788, a trader of sea otter furs with China. He brought 70 Chinese labourers to the Island and built a trading post at Nootka. By 1792, Captain George Vancouver and Juan Francisco de la Bodega y Quadra were working together at the task of mapping and exploring the coast, after years of Spanish/English rivalry had played out on this Island. A treaty in 1793 gave the two countries joint ownership of Nootka, but it was not long after the signing that Spain’s dominance in North America began to wane. The last Spanish ship was ordered out of the area in 1795, marking the end of the Spanish influence In British Columbia. The Western Headquarters of the Hudson Bay Company was Fort Vancouver on the Columbia River (now in Washington, USA). Hearing of the proposed border between American and British Territories, and fearing disruption of its fur trading activities in the north, the HBC built a post on the southern tip of Vancouver Island in 1843, and called it Fort Victoria. Americans started to move north in greater numbers. In order to help contain and control American influence, the HBC enlarged Fort Victoria and moved its Western Headquarters here, while Fort Vancouver remained operational south of the border. Fort Victoria became the capital of the new colony of Vancouver Island by virtue of its proximity to the United States and the salubrious climate of the region. Concerned about the total control enjoyed by Chief Factor James Douglas, the British Government sent Richard Blanshard over as the first Governor of Vancouver Island in 1851. James Douglas didn’t like the new governor, and after 18 months of misery, Blanshard returned to England – and Douglas became Governor of Vancouver Island. When the colonies of Vancouver Island and the Mainland combined, in 1864, James Douglas was knighted by Queen Victoria. Goldrush related activities on the Mainland spurred Victoria’s growth, as miners came up from California to buy licences and goldmining gear. Somewhat prepared, they sailed to the mainland, returning months, even years, later with precious gold dust. Again, the powers-that-be feared an American take-over, and by this time the HBC was losing its hold over the area. The HBC finally dismantled Fort Victoria to make way for commercial buildings, and Victoria was incorporated as a city, with a mayor and a council to keep everybody in line. On April 2 1868, Victoria became the provincial capital of British Columbia. Today, many of the landmarks on the Island are remnants of the lumber barons, traders and miners who settled here, and the Chinese labourers who came to build the railway. The combination of rugged wilderness, European refinement and First Nations and Asian culture make Vancouver Island a unique destination.